Here is an old blog that we wrote that I wanted to bring to yall's attention again! 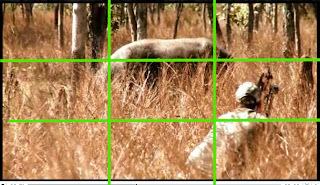 No one wants to watch a hunting video that is just the camera pointing in the same location or having the subject directly in the center of the shot. There are different techniques when it comes to framing your subject that can be used by just placing your subject in a different location. Framing is a technique that is used in videography and photography to bring the focus to your subject. One rule of thumb is the "Rule of Thirds" that states that an image should be imagined as divided into nine equal parts by two equally-spaced horizontal lines and two equally-spaced vertical lines, and that important compositional elements should be placed along these lines or their intersections. (2) Aligning a subject using these points can create more tension, energy and interest in the subject more than simply centering the subject. If you line up your subject in an equal distance from all sides there is no implied need to move, the subject is static. The object is balanced, and therefore at rest. This implies no tension or energy. Of course, the "Rule of Thirds" is just a guideline. If balance is what you are trying to express. then central placement of your subject is the way to go. 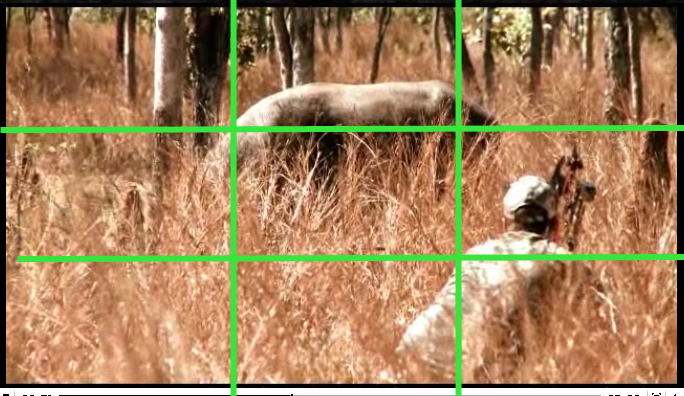 Notice in the screen shot to the left that the the hunter is at the bottom right intersections and the animal is in the upper thirds of the shot. This adds depth and tension to this shot. 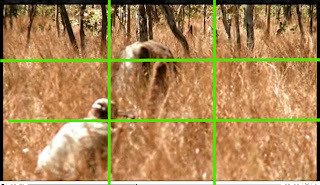 Notice how the same tension and depth is created when the hunter is now in the left lower-thirds intersection. These same guidelines can help with setting up close-ups as well. In close-ups the subject will be in more of the shot but strategically placing the key focal points by intersections creates a dramatic shot. Notice how the two main focal points in this screenshot are Nicole's eye and the point where the arrow meets her mouth. This shot allows the audience to focus in on her eyes showing her focus on something and her mouth to show how much drive she has. Another way to work with the "Rule of Thirds" is when you have multiple subjects. In this shot there is the water buffalo (peeking out on the ridge) and the Hunters. A Counterpoint is when you place one subject at a focal point and the other subject at its diagonal opposite. Remember that the "Rule of Thirds" is just a guideline and your subject(s) do not have to land exactly on a focal point, just close enough to still portray meaning. It is common practice to place the horizon line along the one-third line or the two-third line of the grid, rather than in the middle. 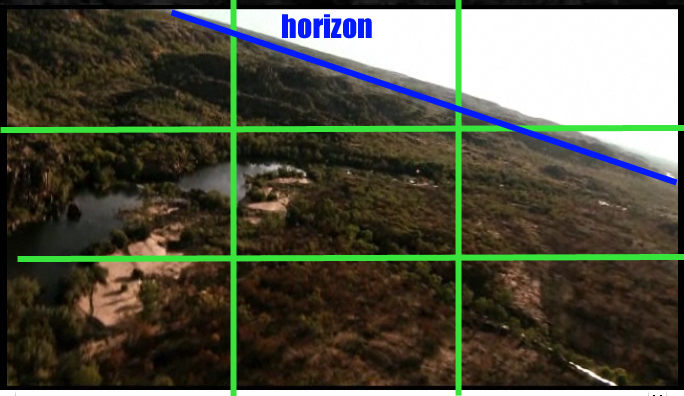 Most beginning videographers will make the mistake of placing the horizon in the middle, which creates a dull and uninteresting shot. Pat Reeve plays around with his horizon shot here by placing it in the upper thirds and at an angle for a different and more interesting shot. (1) Pat Reeve (2010). Australia 2010 Trailer. DrivenTV. (2) Bryan F. Peterson (2003). Learning To See Creatively. Amphoto Press. 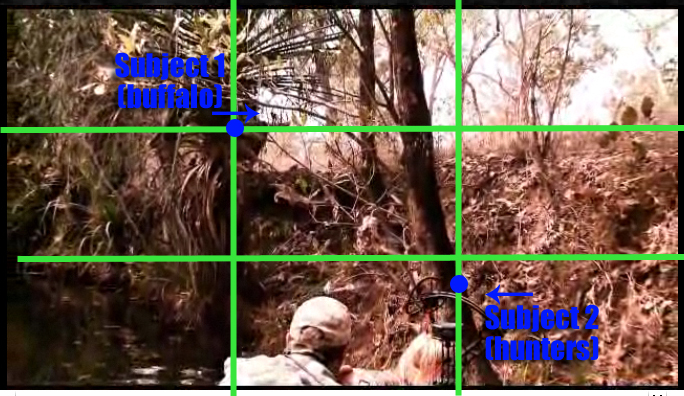 Item Reviewed: Understanding the Rule of Thirds 9 out of 10 based on 10 ratings. 9 user reviews.